If you have water seepage in your crawl space, TerraBlock™ can be combined with drainage matting to direct water to a sump pump system. For added durability, an additional crawl space liner may be installed on top. Save money and control mold and moisture in your home with our crawl space products today! For a free crawl space insulation quote, contact us today! We serve Asheboro, Sanford, Fayetteville, and many nearby areas in North Carolina. At Antex Exterminating our team of in-house crawl space experts has just what you need to encapsulate your crawl space and keep it a warm, dry, and clean-looking place--one you won't mind crawling into! 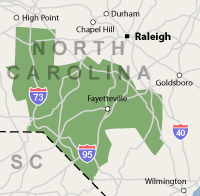 We proudly serve Fayetteville, Sanford, Asheboro, and many other parts of North Carolina.